The World is the 21st and final numbered Major arcana card (counting The Fool as 0, of course). 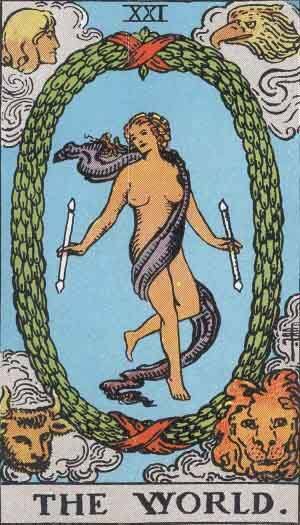 In the journey of The Fool, it represents the end of the cycle, and the start of a new one. The World represent fulfilment, accomplishment and success. Past – The World in the Past position means that things are coming full circle. In a manner of thought, time is cyclical. Months go by and come back again, weeks are but short rotations of the same 7 days. Make sure you understand you past and don’t make the same mistakes that might throw you back to where you started. Present – The World in the present position means that you might feel like you’ve done it all and there’s nothing else to conquer. Help others realise their goals. If there’s something you’ve wanted for a while, it may very well appear very soon. Different viewpoints will help you here, as they always will. Future – The World in the future position suggests that you need to find your destiny. You may not believe you have a purpose, but even as a single person, you can make change. Don’t be afraid of failure, take up a new project and run with it. Think about what you want from life, are you currently on the path to do this? Work / Education – The World in regards to work or education means that you might feel like you’ve run your course in your current occupation. If you’re in college, you might feel like a change is needed. There are many aspects of our life when we feel like this. If there is nothing else to learn, the mystery changes to mundanity, and we become like cogs in a machine. You need to look elsewhere, even if you’re happy in your job or schooling, there could be so many other great opportunities elsewhere. Romance – The World in romance is a good sign. You can reach a level of understanding with your partner that will take you to new heights and enjoyment. Likewise, if you are single and looking, The World can represent the ending of the cycle of singledom and the start of a relationship very soon. treat it all as a cycle. Friends – The World in regards to friendship means you may take up some new activity with your friends. It’ll likely be introduced as a trend and take off, but it’ll be something you enjoy together. If you’re worried about your friendships, it might be that you’ve outgrown them, or the opposite. You need to keep people around you who are supportive, inspiring and motivating. Money – The World in regards to finances is generally a good sign, especially if things haven’t been going well recently. Remember to save and don’t spend crazy. If you have some surplus money, it might be wise to invest them all in a new creative project, or that thing you’ve been after for a long time. You’ve lived this long without it, after all. Health – The World is mixed when it comes to health. Ending of cycles and starts of others can mean that an illness is going to abate. It can also mean that you will take to heart a whole new way of living. Have you tried being vegetarian, or having a similar changed diet? There are many ways you can change what you intake which make you feel different about your body. Everything you take into your body contributes to it; take in rubbish, and you’ll feel like it. Take in clean natural food, and you’ll feel the difference. Spirituality and Mentality – The World in spirituality might mean a massive overhaul of your belief system. You may feel you’ve learned it all. Do not throw away your core beliefs, but use other systems to contribute to it. Eclectic belief systems are just as valid as an established one. You know what is right for you. In reverse, The World can mean that the current cycle is not coming to it’s intended completion. Think about your current life. You are ready to take the next step but something is holding you back. Fear, worry, responsibility. These can all be possible causes that are holding you back. Sometimes you need to sever ties to let both parties grow, and other people may be waiting on you to catch up to them. We’ve selected live tarot readers to give you a FREE 3 Minute interpretation of the World! Scroll through them below and pick your favorite one.